Russell Hobbs Burn Claims – Has your Russell Hobbs iron burst into flames? Have you been burned by a faulty Russell Hobbs iron? Do you wish to make a claim for compensation? A recall has been issued by Russell Hobbs amongst safety concerns relating to 15 different models of iron. The BBC Watchdog programme carried out an investigation after consumers reported loud bangs, popping noises, sparks and flames coming from their irons. We can help you with Russell Hobbs burn claims. Simply call 01925 937070 or complete the ‘Contact our Solicitors’ form at the bottom of this webpage and we’ll call you. The recall was a while ago but we are still taking on claims from clients who have suffered burn injuries after the flex on their irons failed. Many people have been unaware of the recall. Call us today for free legal advice on 01925 937070 or fill out our Russell Hobbs Burns Injury Enquiry Form by clicking here. If you have sustained injury as a result of one of the faulty irons you are entitled by law to claim compensation. Do not worry if you do not have the receipt for the iron – contact us immediately for advice. Russell Hobbs may request that you return the iron to them to assess the fault. DO NOT send the iron back to Russell Hobbs or agree to it being collected until you have spoken to us or it could severely prejudice your claim. 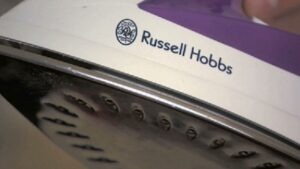 Making a claim against Russell Hobbs for your iron injury or burn is simple. You can telephone us on 01925 937070 or click here to complete our Russell Hobbs Iron Injury Enquiry Form. Why choose DSM Legal Solicitors for your Russell Hobbs burn claims? We act for a number of clients who have sustained serious electrical burns to their hands and wrists, due to a faulty Russell Hobbs iron, so we understand the process. We are able to claim all associated losses, such as loss of earnings if you have had to take time off work. Burn injuries can severely impact on day to day life and interfere with activities such as showering, driving, cooking, shopping, lifting and carrying, playing sports, looking after children and doing housework. In some cases scarring has occurred. Following these incidents clients often report feelings of anxiety when using irons. We provide free initial advice and deal with Russell Hobbs iron burn claims on a no win no fee basis. As there are strict time limits for bringing claim we strongly advise that you contact us as soon as possible if you need advice about bringing a compensation claim. We have a great deal of experience of these types of claims and have obtained compensation for all of our clients who have been burned by a Russell Hobbs faulty iron. Contact us on 01925 937070 for help and advice. Take photographs of the injury. Seek medical advice for the injury. Take photographs of the faulty Russell Hobbs iron clearly depicting the defect. Keep a careful note of the time and date the incident occurred and details of witnesses. Retain the iron – do not return it or dispose of it. We act for clients throughout across England and Wales – you do not need to travel to see us. Claims can be dealt with over the telephone, by email or by letter. Call us now on 01925 937070 to speak to one of our expert solicitors or click here to complete our Russell Hobbs Iron Injury Enquiry Form. We will contact you within one working day. We have experience of dealing with Russell Hobbs burn claims and have recovered compensation for numerous clients who have suffered as a result of these faulty irons. Bringing a ‘No Win, No Fee’ Russell Hobbs personal injury claim is very straightforward. If your claim does not succeed there is nothing to pay – that means there is absolutely no financial risk to you. Call us today on 01925 937070 and find out more or email Diane Massey at diane@dsmlegal.co.uk, or click here and complete our Personal Injury Claim Form and we will call you. We can assist with personal injury claims (accident and serious injury claims), medical negligence, making a will, criminal injuries compensation claims, employment law claims, wills and probate, oaths, affidavits and statutory declarations, lasting power of attorney, settlement agreements and professional negligence claims. Simply click here to complete our Compensation Enquiry Form or call 01925 937070 for a free, confidential discussion with an expert solicitor. We’re more than happy to answer any questions you may have.